This is it. The final installment of the 4 year long feature film / OVA foray back into the Gundam UC universe. Gundam Unicorn volume 7 neatly wraps up all of the loose ends and plot points that have been introduced over the previous 6 volumes and if you’ve been following the series yourself, you’ll know that there was plenty to put to bed. Laplace’s Box, that mysteriously powerful something has been located and revealed and takes us back to where it all began. Banagher is hot on the heels of Full Frontal winding up back at Industrial 7 but before his final battle, Banagher must first get through the Rozen Zulu and Banshee Norn. Needless to say, this series could not successfully be resolved without a massive amount of action and action we get. 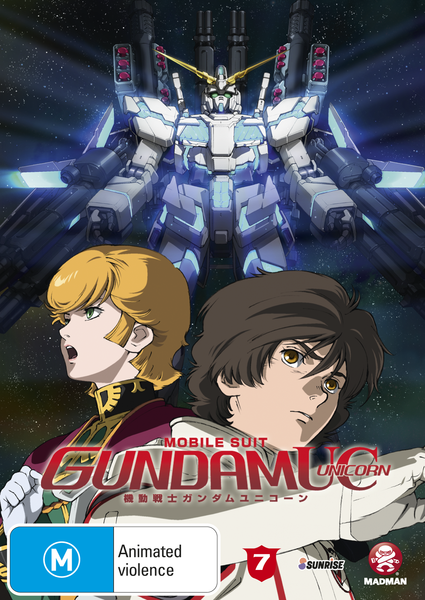 Instead of slicing through nameless, faceless automatons, Banagher and the Unicorn face off against Angelo and Riddhe, two extremely capable pilots in two extremely powerful mobile suits. What eventuates is a high stakes sequence of beautifully realised action. 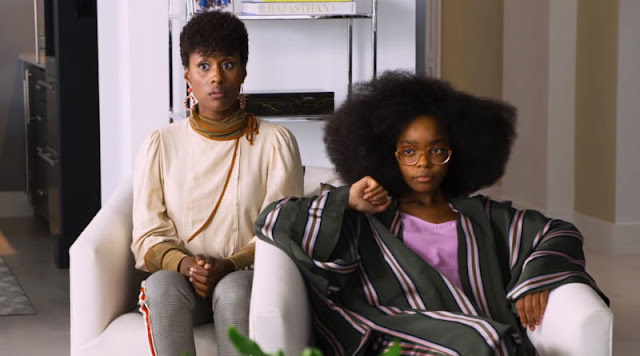 Animation studio Sunrise have used every bit of their feature film equivalent budget to create some of the most glorious, razor sharp and frenetic animation that you’re likely to see. 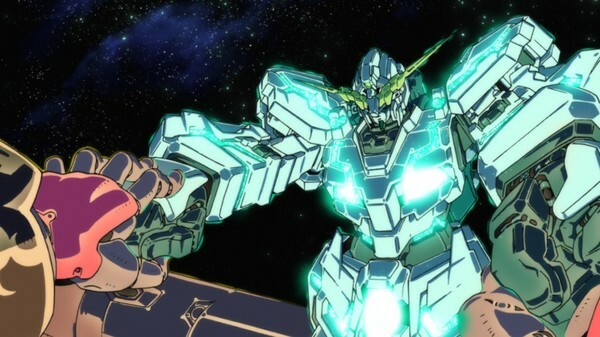 Gundam 00 looked fantastic but there’s no denying that Unicorn is the absolute best looking addition to the series yet. The mech designs are also up there and completely memorable. 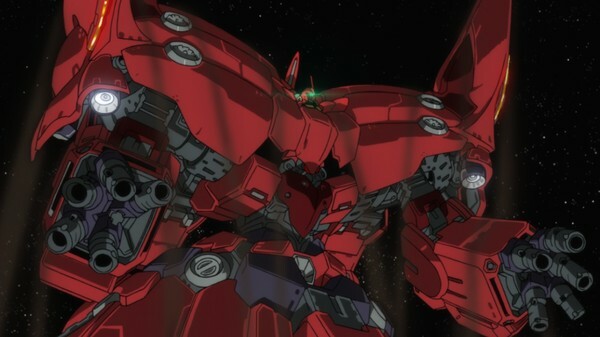 Even the cynic in me who thinks that the Gundam franchise is heavily influenced but Gunpla sales is satiated and filled with desire to build my very own Sinanju. This series was initially slated to be a 6 part series but was thankfully extended to 7 parts. With so much industrial and political intrigue still unfurling into this 7th volume, there is no way, without seriously compromising the pacing of the story, that it could have been wrapped up in 6 parts. When it does get wrapped up, however, the finale has one of the best pay offs I can remember with some crazy twists and characters still developing even late into the game. When speaking of character development, it’s unfortunate that Banagher in particular comes across as being so one dimensional with the only string to his bow being his staunch anti-war stance. 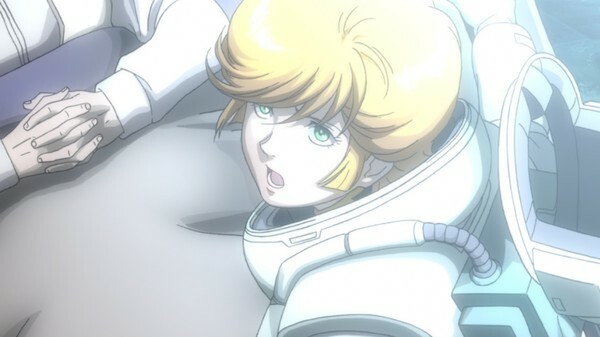 Surrounding characters, however, manage to shine where Banagher doesn’t. Bright Noa, Londo Bell and “Char” are all far more interesting with the latter being far less “evil” than first thought while still maintain a desire to conquer. Questions over morality and good vs evil are introduced, particularly with the unveiling of Laplace’s Box and the way in which it could truly destroy a nation. Without ruining any surprises, the true contents of Laplace’s Box is so satisfying and befitting of this wonderfully thought provoking series. If all series utilised plot points as deftly we’d be surrounded by masterpiece’. While many first time Gundam viewers may be lost along the way (even I found it hard to keep up at times), this is a must watch for already established Gundam fans and a great introduction to the universe for the unacquainted. 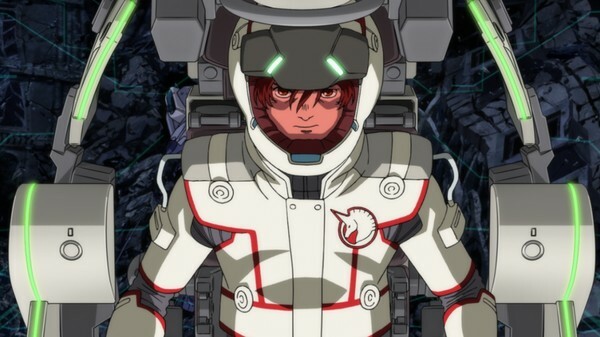 Offering far more than the usual child soldier in a robot schtick, Gundam Unicorn is richly populated, evocative and brilliantly animated, and also has a stunning soundtrack by my new favourite composer, Hiroyuki Sawano. Gundam Unicorn has reinvigorated my love for the franchise and has me hopeful for even more localisations in the near future. Gundam Unicorn Volumes 1-7 are available on DVD now from Madman.